A mallard glides gracefully across Lily Lake. I had intended to get to Lily Lake before sunrise to scout out some locations for capturing the sunrise on the lake, but due to laziness on my part (I didn’t get out of bed early enough, though in my defense I was still recovering from a cold I’d had all week), and then I took a wrong turn and by the time I’d gotten turned around and made it to the lake the sunrise had already happened. As I was getting out of my car and (figuratively) kicking myself for arriving late, I walked up to the lake and this was the scene which presented itself. So in the end, my late arrival was very fortuitous. 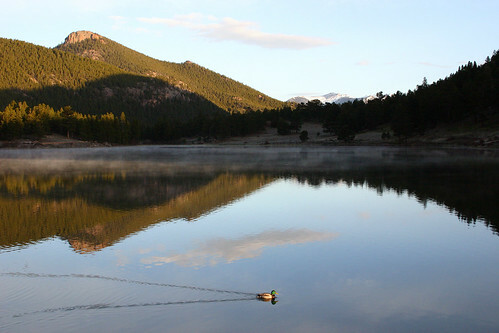 This entry was posted on February 26, 2008 at 8:25 am and filed under animal, Colorado, Estes Park, lake, Lily Lake, mallard, mountains, National Park, Rocky Mountain, Rocky Mountain National Park, vacation, water.